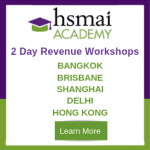 HSMAI Asia Pacific runs face-to-face workshops to support our online program ‘Certificate of Revenue Management (Hospitalit)’ and our Certification programs ‘Certified Revenue Management Executive (CRME)’ and ‘Certified Hospitality Digital Marketer (CHDM)’. More information about Online Courses and getting Certified in Revenue Management or Digital Marketing is available at our HSMAI Academy website. Check our Events page for the next events and workshops near you. Would you prefer a private workshop for your staff or association members? Please contact us for more information on private sessions.